Exclusive Ushuaïa Ibiza Beach Hotel designer robes. Flat-screen TV 52" with national and international channels. Maxibar * with wide selection of Premium drinks and fridge * with softdrinks, water and beers. Music and hotel information channel. Nespresso coffee machine with complimentary capsules throughout the stay. Outdoor terrace with hammocks and furniture. Separate lounge Hair dryer Separated WC. 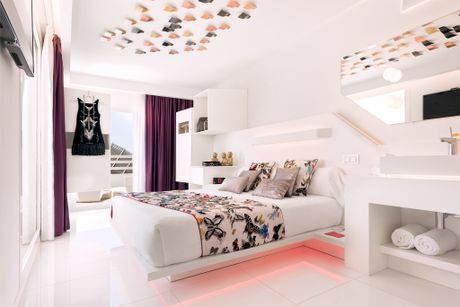 All guests staying at Ushuaïa Ibiza Beach Hotel have free access to the amazing hotel parties. Complimentary champagne bottle upon arrival. Private check in service and personalised VIP service courtesy of the VIP service department 24 hrs. ** Only booking on this site. Free transportation to and from the airport. It is required to make the request of the transfer to Experience department(experience.club@ushuaiabeachhotel.com) 24 hours before the arrival of your flight. Subject to availability.